Dwayne Michael Carter, Jr. (born September 27, 1982 in New Orleans, Louisiana), better known by many as Lil Wayne, is an American rapper. Formerly a member of the rap group Hot Boy$, he joined the Cash Money Records collective as a teenager. Get It How U Live, released in 1997, was Lil Wayne’s first album with Hot Boy$. Lil' Wayne's first solo album, Tha Block is Hot (1999), was certified platinum. His following albums, Lights Out (2000) and 500 Degreez (2002), went gold. Tha Carter (2004) brought Lil' Wayne even more success, specifically the hit single Go D.J.. Tha Carter II (2005) and Tha Carter III (2008) were his next studio efforts, with the latter being a runaway success selling over 1 million copies in the first week of release in the United States alone and winning the Grammy Award for Best Rap Album. It included the the singles Lollipop, A+Milli and Got+Money. 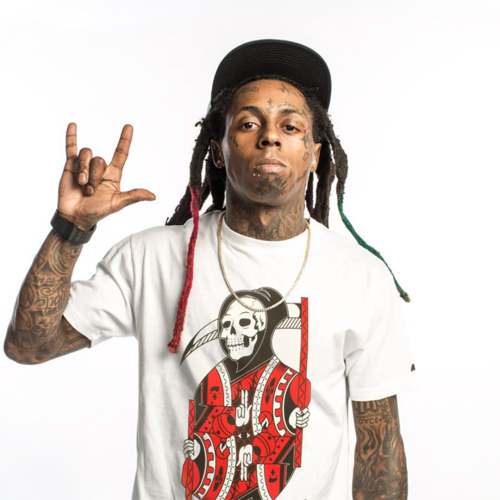 Lil' Wayne released two albums in 2010; Rebirth, a rock concept album and I Am Not a Human Being, which was released while Carter served time for criminal possession of a weapon. Tha Carter IV (2011) featured singles 6 Foot 7 Foot, How to Love and She Will. By August 2012, Carter passed Elvis Presley as the male with the most entries on the Billboard Hot 100 chart, with 109 songs.